Pooped from yesterday's hoopla? Sit back and relax. 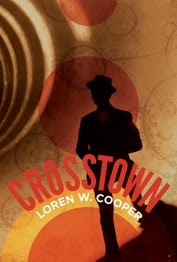 We have author Loren W. Cooper in the house today for the Supernatural Central quick chat. LC: The main character, Zethus, is a working sorcerer and a Master of the Ways of Possibility. He lives on the edge of CrossTown, a place where all of the possibilities inherent in roads come together. Zethus knows how to manipulate those possibilities to cross between realities, but he is also a working sorcerer, which means he earns his living by handling hostile spirits for folks who can't deal with them. As a sorcerer, Zethus has a Legion of Spirits he has built over time. One of the themes for Zethus, who was a Classical Greek character at a time when the world was comfortable with slavery, is how his perspective changes over time regarding the enslavement of the spirits. SC: Speaking of spirits, do you believe in the paranormal and if so, do you have an experience you can share? LC: If I define the paranormal as “denoting events or phenomena that are beyond the scope of current scientific understanding,” then yes, as the scientific framework is constantly developing. As a Christian, by default I believe in the supernatural. And numinous religious experience is not something measurable within the scientific framework (though brain scan studies and the like can map some of the accompanying phenomena—such measurement does not mean the experience equates to the firing cells). Even within the framework of science and philosophy, Jung's ideas around asynchronous events have always been very interesting. Jung's mystical slant offended Freud, but there's more humanity in Jung's theories, and inherent to the nature of asynchronous events is the fact that they oppose synchronous measurement. Things like quantum tunneling and quantum entanglement are measurable and predicted within the framework of modern physics, and yet they were outside the comprehension of classical physicists. Michelson famously said “it seems probable that most of the grand underlying principles have been firmly established and that further advances are to be sought chiefly in the rigorous application of these principles to all the phenomena which come under our notice...” This was at a dedication speech for Chicago's Ryerson Physical Laboratory in 1894. Einstein had yet to hit the scene. So, are there things beyond the scope of current scientific understanding? Undoubtedly. One of the darkest frontiers is the human mind. SC: .What titles are you working on now that you can tell us about? LC: Actually, I have a complete draft I'm letting sit for rework that is a future history. Central to the story is a science fiction framework that approaches the development of psychic phenomena from a Jungian, asynchronous events perspective. As Arthur C. Clarke has it, any sufficiently advanced technology is indistinguishable from magic. The goal of that story is to blur those lines. SC: Thanks for stopping by. Let's take a look at your book now. Roads and streets run like veins and arteries through the beating heart of CrossTown. Each runs through all manner of distant and not-so-distant possibilities. There's a theory in modern physics that posits a universe for every decision we make. Each time we choose, right or left, high or low, vanilla or chocolate, we split into separate universes. A vanilla me here, a chocolate me there, a rocky road with pistachio me somewhere else, and some poor lactose intolerant me further down the line. The dominant me is my subjective reality. In CrossTown, the probable mes collapse into the dominant wave, but all those wandering Ways continually wash other alternate lives, lives meant to be lived in CrossTown, up on its jagged shores. Everywhere, every place and every time where man or something like him has lived, roads run into one another, branch, disappear here and reappear over there as if they were quantum tunneling. They run, meet, part, cross again, and form a bewildering Mandelbrot set of linked probabilities. Beware the road outside your front door, for it is both old friend and passing stranger. CrossTown is the crossroads of probability.